In the previous tutorial, we have discussed the introduction and features of Spring Web MVC and its project structure. 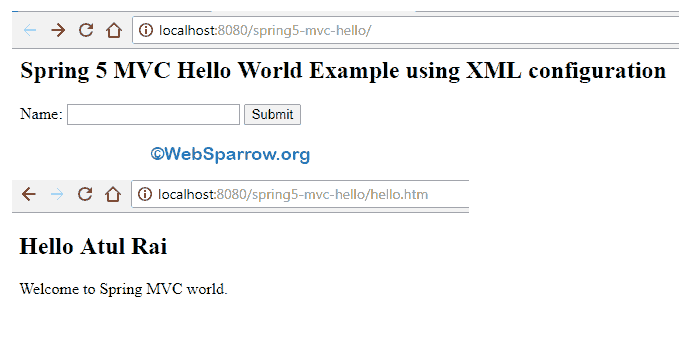 On this page, we are going to show how to create a small Spring MVC application that takes your name as input and greets you. Well, we can configure your Spring MVC application in many ways but this tutorial is focused on the XML based configuration. Find the list of all technologies that I have used in this application. To create Spring MVC application, you must need Spring MVC jars in your project build path and Maven is a great tool to do that. Add the following dependency to your pom.xml file. You can it manually by adding JAR’s to project build path. 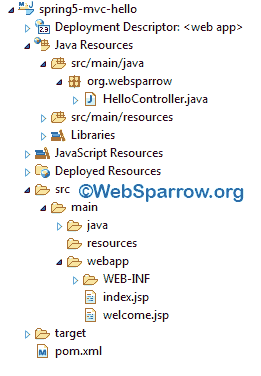 Check the project structure of Spring 5 MVC hello world example using XML configuration in Eclipse IDE. Add the Spring MVC front controller i.e. DispatcherServlet to your web.xml file. If you have no idea about URL-pattern click here. To handle the user input request, create a HelloController class that implements Controller interface which has one method handleRequest(request, response) and its return type is ModelAndView. You have may option to create the controller class that we will learn in the next tutorial. It’s not compulsory to use dispatcher name, you can choose any name whatever you want. Create the JSP pages that visible on the user machine. index.jsp: This page will take the username and sends a request to the controller. welcome.jsp: This page will greet the user. Finally, everything was completed. Run your project and will get the following result.